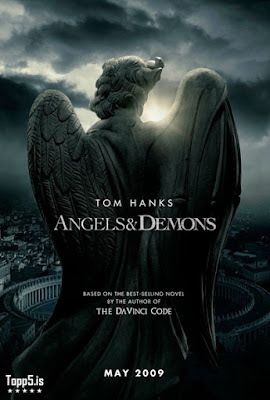 The prequel to The Da Vinci Code, Angels & Demons which is set to release May 15th 2009 has its first One-Sheet for us to gander at. Ron Howard is again directing the Robert Langdon story that this time follows the Harvard symbologist, who is summoned to a Swiss research facility to analyze a mysterious symbol seared into the chest of a murdered physicist. He discovers evidence of the unimaginable, the rebirth of an ancient secret brotherhood known as the Illuminati, the most powerful underground organization ever to walk the earth. Thoughts on the Angels & Demons poster? Are you interested in the prequel? Let's hope Tom Hanks has a new hair do this time around! Was The Da Vinci Code a disappointment?